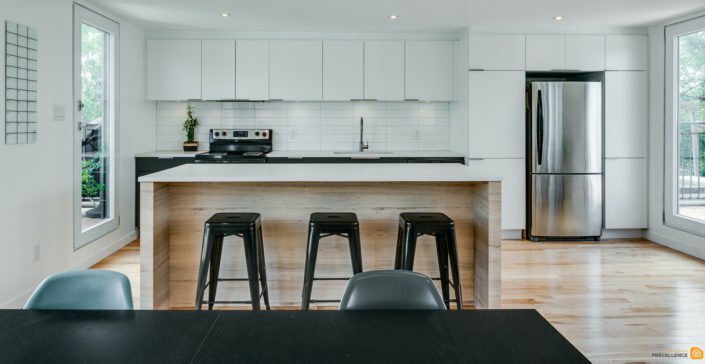 Discover this magnificent kitchen renovation project in a duplex in Ahuntsic. You too can benefit from our expertise as a general contractor in residential renovation and our turnkey services. Call us today for a free consultation! The kitchen is one of the places in the house where we spend the most time during the day: it must be warm, functional, but also have a touch of style. The owner of the duplex wanted to give a second wind to the kitchen area of his apartment. 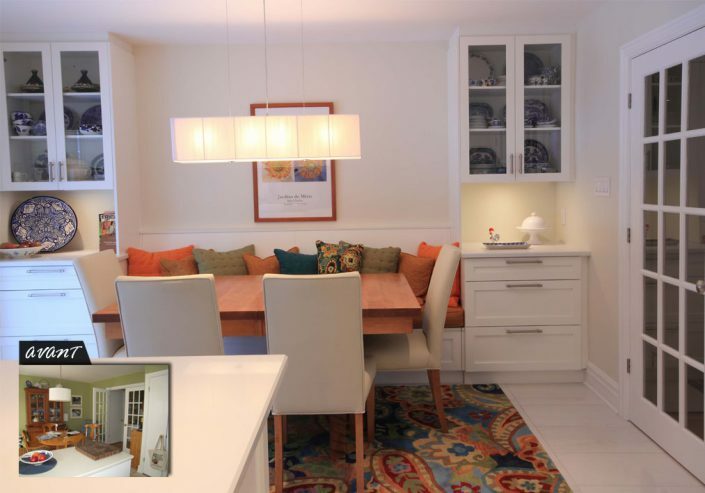 With our kitchen designer, we have developed a kitchen renovation plan to achieve our client’s vision. First, we had to demolish the kitchen almost completely. We had to remove the cabinets, kitchen counter, floor and redo part of the windows to maximize the brightness. Subsequently, we changed the linoleum floor to a laminate floor with a grey ceramic finish. 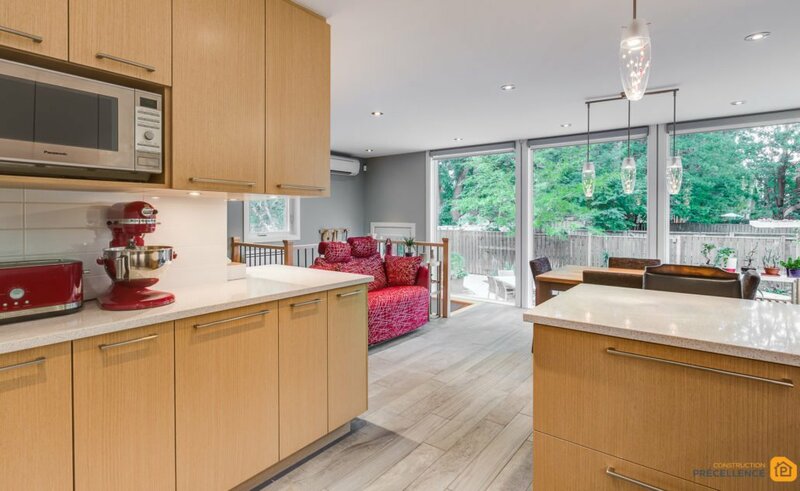 We have chosen custom-made white melamine kitchen cabinets and melamine drawers with a wood finish for maximum storage. We opted for a counter with white laminate covering. 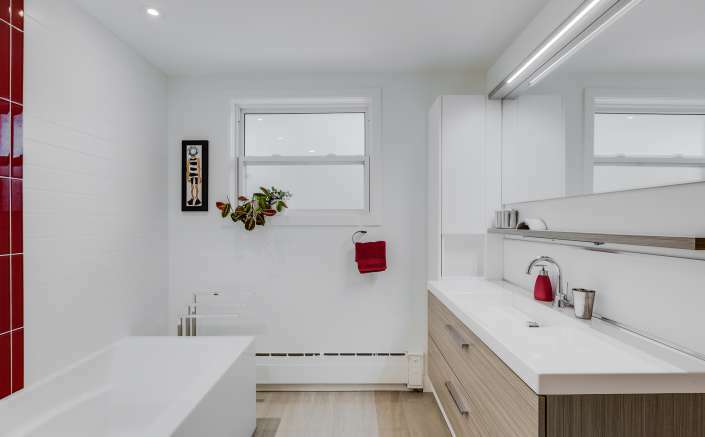 This counter includes a single bowl sink with stainless steel fittings. This counter also accommodated a dining area for two people. For a contemporary touch, our designer-kitchen designer advised our client to add stainless steel appliances (glass ceramic stove, two-door refrigerator with freezer and dishwasher.). 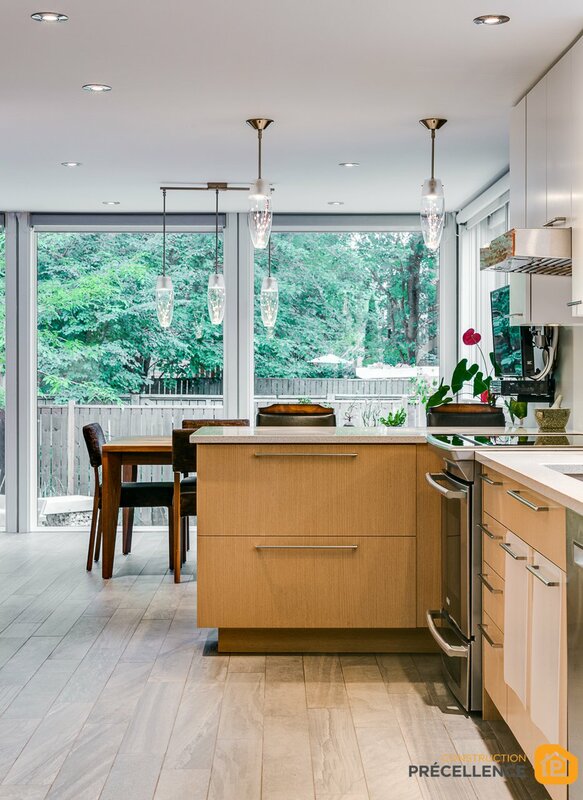 For lighting, we have chosen recessed ceiling lights as well as two lamps suspended above the dining area. 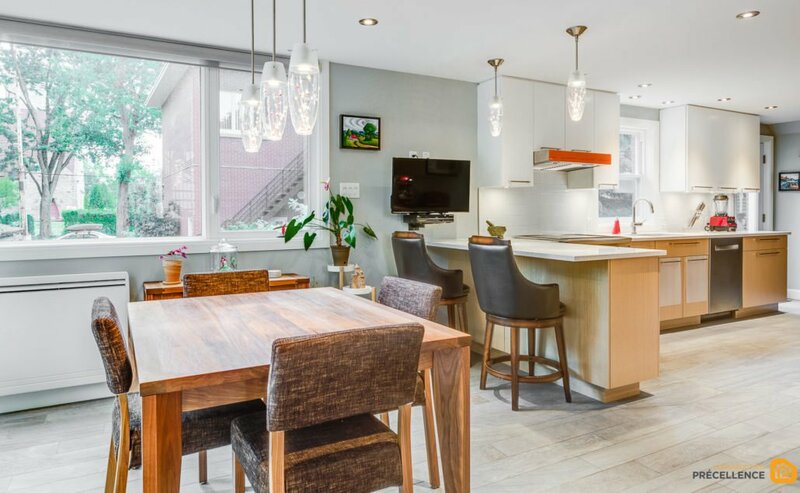 As a general contractor specialized in kitchen renovation, it is our duty to take charge of each step of this project. 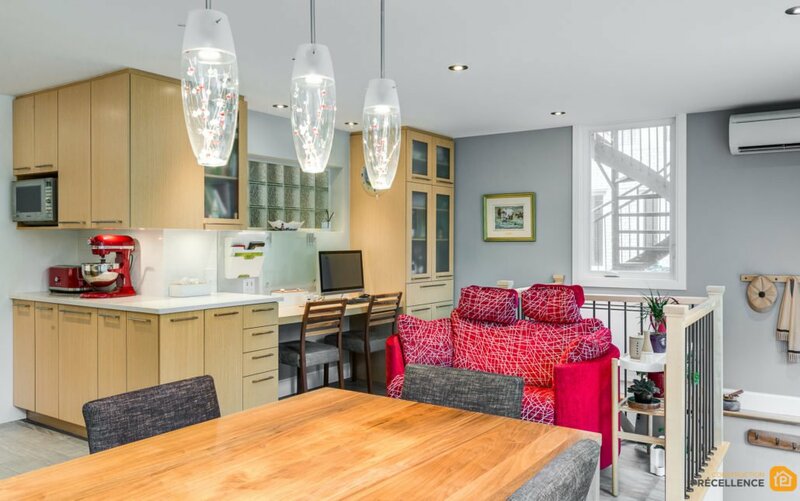 To do this, we called on electricians, plasterers, painters, cabinet and counter manufacturers, floor covering specialists and door and window manufacturers to make this renovation project a great success. 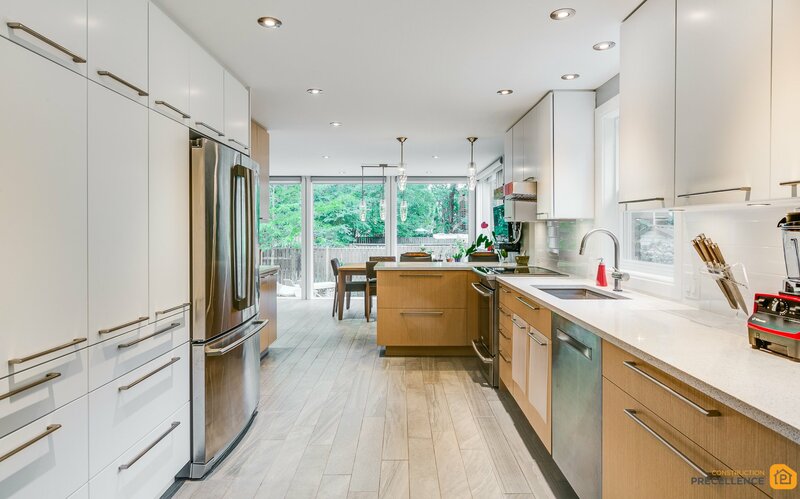 If you would like to know more about this kitchen renovation project in a Ahuntsic duplex, our turnkey renovation services, our prices, or our services, we invite you to contact us by email or phone. Your first consultation is free of charge! Our team will be happy to welcome you and answer your questions.